What can come of a few college kids heading on a road trip aside from long drives, fast food, and fond memories? How about an independent music and arts collective that sets out to revolutionize the hip-hop game? In the case of Chigo Ace, Michael Fang, and the rest of Third Force Collective, that’s exactly what happened. 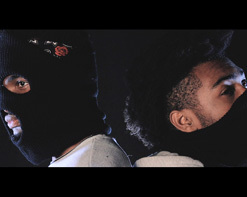 Chigo Ace and Michael Fang are gaining early traction for the group with their collaborative new hip-hop smash, “Now”. Third Force Collective was conceived in Dallas, Texas by students of Texas Tech University. Like the rest of Third Force, now General Manager, Courney Harris was just you’re average student. He was in the backseat of a car traveling through the lone-star state when he heard a song and said, “Man, this is good…who is it?” His friends in the front couldn’t help but laugh as they answered, “It’s our first demo!” At that moment it became clear that they had something special right under their noses all along. With independent artists, Chigo Ace, Michael Fang, Li Blanc and Sunny jumping on board, Harris had a roster, and Third Force Collective was born. Since their formation, Third Force has worked in collaboration with musicians, dancers, actors, and visual artists alike. Through the various art forms, there is a constant flow of energy they call the “Darc Wav” that keeps things consistent with the Third Force brand. Chigo Ace and Michael Fang represent the state of the Third Force union in their new single, “Now”. The song opens up with a signature Fang hook, easing us in right away with a smooth coat of autotune. Ace takes the reigns in the verses, delivering his lyrical swagger and intricate cadences with a confidence that makes it looks easy. The “Now” music video opens with budding model/actress, Kylie Boyd luring us in, seductively singing Fang’s melody as he gets to work in the background. Fellow Texas Tech alumni and Filmmaker, Uzo follows the Third Force stars around their college town of Lubbock as they party the day away, refusing to concern themselves with anything but optimism. “Now” shows us that Chigo Ace, Michael Fang and Third Force Collective don’t need major labels to achieve success in this industry. With the power of the Darc Wav at their backs, this group of college friends are becoming a force to be reckoned with in the modern world of hip-hop. We are absolutely ecstatic to be a part of the exciting new movement that is Chigo Ace, Michael Fang and Third Force Collective to bring you the “Now” music video and see it included in your regular programming. Don’t hesitate to let us know what we can do on our end to make that happen. Please contact Andy Gesner and the HIP Video Promo team at (732)-613-1779, email us at info@HIPVideoPromo.com or visit www.darcwav.com for more info on Chigo Ace, Michael Fang and Third Force Collective.